The US military sending an further battalion of 400 soldiers with multiple-launch rocket systems to South Korea. The Pentagon is claiming the reinforcement is unrelated to tensions on the Peninsula but rather a part of army reorganization. A battalion from the 20th Field Artillery Brigade will be deployed in June for a nine-month rotation at Camp Casey in South Korea, according to Pentagon spokesman, Colonel Steve Warren. When the battalion is rotated, it will leave its equipment there so that other battalions can use it. 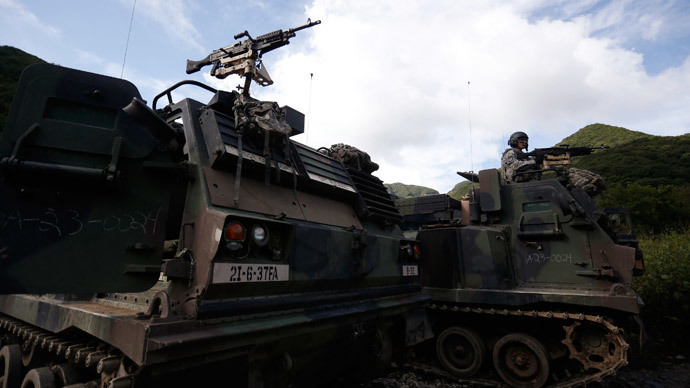 The artillery brigade in South Korea, particularly effective at countering enemy batteries, is the only one permanently stationed outside the United States, officials say. The extra 400 soldiers represent a slight increase in the 28,500 US troops already stationed in South Korea. “The addition of this battalion is part of an Army-wide reorganization that will raise the number of MLRS (multiple-launch rocket system) battalions in all field artillery brigades from two to three,” Warren said, cited by Reuters. The US army has undergone a massive restructuring program in recent months due to budget cuts. It is expected to reduce the number of active duty soldiers from 570,000 to 490,000, and may even be reduced to 420,000. The new deployment comes as around 10,000 South Korean and 8,000 US troops are taking part in the annual land, sea and air military exercises dubbed ‘Foal Eagle’.